Independent laboratory testing found a class of chemicals known as phthalates in 52 of 72 (72%) of the tested personal care products, according to a report released in early July 2002. Nail polish, hairspray, perfumes, and deodorants were among the products tested. Phthalates have been shown to cause birth defects and damage to the liver, kidneys, lungs, and reproductive system in laboratory animals. A recent Center for Disease Control study found surprisingly high levels of phthalates in the population, particularly among reproductive-age women -- up to 20 times more than the average dose, with the highest measured levels above the current federal safety standard. Perfumes -- including the mysterious "fragrance" ingredient listed on the labels of almost all personal care products -- are particularly prone to contain phthalates. This is particular troubling because, unfortunately, there is currently no way of knowing the ingredients that perfume products contain. Labels aren't required for perfumes, colognes, and other fragrance, and fragrance ingredients don't have to be tested before they are added to perfumes and used by the public. Kim Erickson notes in the recent book Drop-Dead Gorgeous that only thirteen perfume ingredients have been voluntarily tested by the fragrance industry, and none have been tested for their ability to cause cancer or disrupt hormone systems. The Research Institute for Fragrance Materials puts out an advisory list of ingredients that fragrance makers should avoid or use in small quantities, but compliance is entirely voluntary. A recent Environmental Working Group investigation found phthalates in every one of the 17 common perfumes it tested.Phthalates are not necessary to any of the products in which they are used. For each type of personal care item, phthalate-free products are available -- often produced by the same company that used phthalates in another brand.Go to the website to see if your product contains phthalates. Visualize the kitchen of your dreams with our 3–D Kitchen Designer. Design one of our showrooms or customize a floor plan of your own. Save your designs on the site and update them whenever you'd like. Know what your budget can buy before you start calling contractors. Plug in your ZIP code and basic project information, and the Remodeling Budget Estimator will supply an estimate based on regional pricing. Browse hundreds of professionally designed kitchens in Designers’ Portfolio. See Today’s Featured Rooms, peruse rooms or styles and visit luxury showrooms. When you find a room you like, save it to your portfolio. Think you’ve got a flair for decorating? Rate My Space lets you share your designs with the world. Send to friends, rate your favorites and browse other HGTV.com users’ spaces for ideas and inspiration. Y’all, I have absolutely fallen in love with glitter eggs this year! 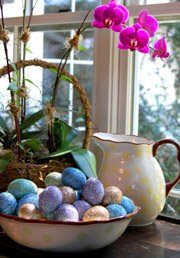 They are so beautiful and such a different take on the traditional dyed Easter eggs. I thought I would share the “how to” with y’all for your Easter baskets this year. 1. With the large sewing needle, poke a hole into one end of the egg. Wiggle the needle around for two reasons, to make the hole a little bigger, and to “scramble” the yolk inside the egg. 2. Poke a hole into the other end of the egg, and wiggle around for the same reason as above. 3. Put your mouth to one of the holes and blow real hard so that the inside of the egg comes out the other end of the egg. If your having trouble, make the hole a little bigger on one end. 4. Run the egg under cold water and let the water get into the egg, allow the egg to drain and dry COMPLETELY before you continue with the glitter. 5. With a small paintbrush, paint the egg with the white glue. Y’all should use brown eggs because you can see the glue much better using brown eggs, and you won’t have “naked” spots on the egg when you glitter. 6. Pour glitter on the paper plates and roll the egg in the glitter. Place egg back in the egg carton to dry. You may have to touch-up the glitter a little after the glitter has dried, but that’s ok.
7. Put in your Easter basket and watch the eyes light up!!! TIP: I DO NOT suggest saving the contents of your eggs. Trying to track down that gorgeous lamp you saw on Find Your Style? Shop the products used on the show in HGTV's MarketPlace. Looking for inspiration? Browse hundreds of uniquely designed spaces! Think you've got a flair for decorating? Upload your stylish rooms and rate your favorites. Learn the secret for perfect color combinations! Find out the best colors for showing off your personal style.